Uncle Ray…Rescue Ranger!! | J&A + fun! So this summer some of our friends, the Masons, came to visit! We had a great time with them while they were here! Emmy and Eldon are just a few months apart and always get along great! The Mason’s daughter Lily is a doll too! While they were here we hung out, went hiking and went to the duck pond. I forgot a hat for Kaylee on the hike so she had to wear a swim diaper on her head! I wish I had the picture! It was super fun to see them! Anyway, you may be thinking…what does this all have to do with Uncle Ray! Well…when we went to the duck pond we had a great time throwing bread pieces to the birds. Then when we ran out of bread so Eldon threw my car keys into the middle of the pond! He has a pretty good arm too 🙂 Anyway, as I started calling around about Honda keys I found out that it was going to be like 100 dollars to replace since they put a chip in it to sync it to your car…blah blah blah… So Ray took a rake down to the pond and Emmy showed him where to comb for it! AND he had to wade into the pond like 6 inches up his leg! So that is what makes him a hero right there because I wasn’t going in after them! Anyway, after only like 5 minutes he had a crowd accumulated to watch him and after only 10 minutes he pulled up the keys! He took them home and cleaned them using rubbing alcohol and the remote still works! I couldn’t believe it! 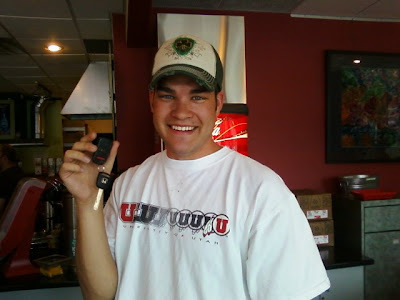 Here is Ray at Ruby K’s with the van key! We took him out to eat there as a reward! I even made him pose for this picture so I could do a blog post about it! Thanks Uncle Ray! WOOOOOT! Ray to the rescue! That’s awesome.